A "Honey Hole" is an underground compost pile. Giant pumpkin growers use this method, to prepare their garden to grow record-breaking pumpkins. The concept of a compost honey hole is simple: Bury a mixture of compost and manure where you will place a plant(s). As the plant's roots grow in search of moisture and nutrients, it reaches down to the rich compost and manure, fueling the plants growth. Similar to the Honey Hole, the Compost Trench is a method where compost is buried underground in rows. Plant a row of your favorite vegetables in the garden soil above it. Like the Honey Hole, as the roots grow, they find the underground treasure trove of nutrient rich compost and manure. 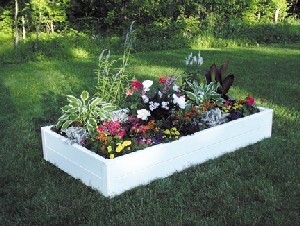 Raised bed gardeners also use this method,. Each Fall the raised bed is emptied to 1-2 feet below the level of the garden soil. It is then re-filled with raw compost materials, in preparation for the next growing season. Over the long winter months, it decomposes, and is ready for your plants in the spring. See Raised Bed Garden Soil. Begin by digging a hole or trench. Dig the hole down to a depth of one to two feet. While garden topsoil often goes down just a few inches, the roots of many plants can go down to a foot in depth, or more. Now your Honey Hole is ready to be filled. Fill the hole with alternating layers of compost, garden soil and manure. Top the Honey Hole off with 2 to 4 inches of rich garden soil. The finished project should be a couple inches above the level of your garden soil. This will allow for settling, and help to drain off excess water. To mix or not to mix- If you use the layered approach above, mixing the materials is not necessary. If you feel better about mixing the materials first, go ahead and give it a few turns. There is no right or wrong way to mix materials. A pitchfork is helpful, to turn and mix materials. Raised Bed Garden Soil - it's a similar concept.